With four dogs living in our home we have a few times that we have pet stains that need to be removed. We lover our pets so much but we do not love some of the smells that come with them. This is a great stain and odor remover. You will just simply spray it on the effected area and let sit. You can then come back and clean up the stain. I usually let it set about 10 min or so then come back with a brush and scrub up the stain. The stains usually come out pretty easily and the smell is eliminated. Now this is for carpets but I have used this product myself on some of my furniture also. (Of course make sure to test it on your furniture before covering a large area with it) but I had not problems at all using it on my fabric furniture. It worked great and removed all the stain and odor easily. 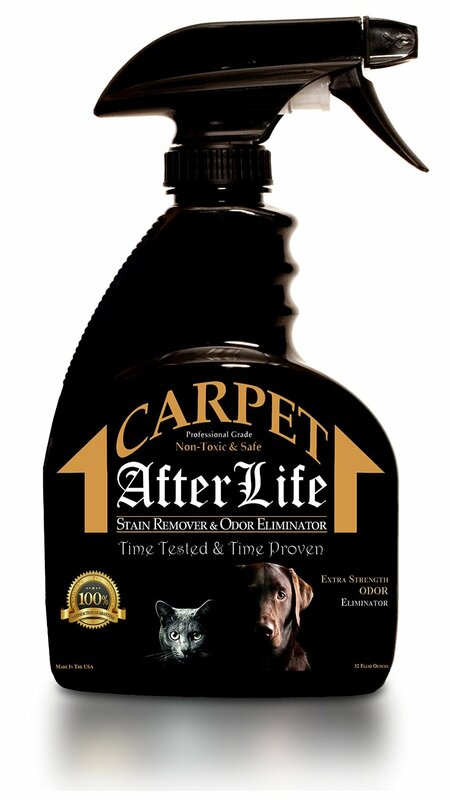 From the trusted Makers of Leather Afterlife comes Carpet Afterlife, the safest, most powerful product yet to permanently remove all odors and stains left by your family’s beloved furry members! ✔ Carpet Afterlife’s Bio-enzymatic formula works to eliminate pet odors rather than simply disguising them. ✔ Since pets are known to “mark their spot”, Carpet Afterlife’s unique formula completely destroys the bacteria and odors that make up these stains, thus eliminating your pet’s ability to re-soil the same spots over and over. ✔ In addition to being used on carpets, Carpet Afterlife can be used on all types of fabrics including upholstered furniture, pet bedding, kennels, carriers, and clothing. ✔ Safe for your pets, safe for your kids, safe for the environment. You can purchase the Carpet After Life on Amazon!